When I was making this caramel and chocolate cake, the recipe called for “Dutch-process” cocoa, which I have never heard of before (and which isn’t stocked in my local supermarket). 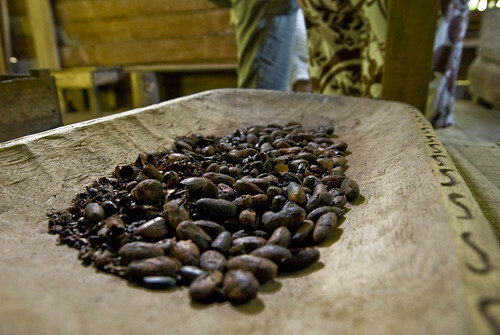 Increases the cocoa’s solubility in liquids. (I think Dutch process cocoa is basically what you use when you are making hot chocolate from scratch, i.e. without a mix such as Swiss Miss, but I could be wrong). As I mentioned, I didn’t have Dutch-process cocoa but the recipe called for it. What would the effects of a substitution be? First of all, because unsweetened natural cocoa (which is what I had on hand) is more bitter, the cake would be a little more bitter. Secondly, because the cocoa I was using was more alkaline, it would react more strongly with the (basic) baking soda I used, causing the cake to rise more than it otherwise would - the reaction between acid and base causes carbon dioxide to form, as you can see when you mix vinegar and baking soda. I was confused about why this would work. I guess the theory is that the baking soda and the acid in the natural cocoa will cancel out and so you’ll have something closer to Dutch-process cocoa, chemically. But, wouldn’t the additional baking soda, since the acid and base will react in the oven, actually increase the additional leavening action, since more reagent is available? I guess it depends on the reaction ratio between the cocoa acid and the baking soda, and whether one or the other is “used up” - if the baking soda is all able to react with the cocoa, it should actually produce more leavening rather than less. From a flavor perspective, I also don’t understand how the baking soda would mellow the bitterness of the cake, but that is just from a lack of knowledge rather than confusion. And then finally, perhaps I am overthinking things. The Wikipedia article explaining the Dutch process for making cocoa powder seems to just say that in the Dutch process “alkalis are added to the cocoa”, so maybe it is a really simple process, and the addition of baking soda to cocoa powder can stand in for it, when everything combines in the oven? Not sure. I’m not sure fully sure what happened here, and it may be a good subject for another experiment. The cake turned out well. If the substitution did not work, it didn’t matter because the cake was not, certainly, overly bitter to me and I didn’t care about how tall it was. The mellowing of flavors in Dutch process cocoa, by the way, doesn’t necessarily seem like a good thing to me. I rather like very strong / challenging flavors, such as my olive oil mayonnaise, and so I might appreciate a slightly more bitter flavor in the cake. On the other hand, would I like hot chocolate made with unsweetened cocoa? I’m still a little confused about all this but hope to figure it out in time. I might revise this entry later. By the way, in an original red velvet cake, the cake turns slightly red, apparently because of the reaction of the acidic cocoa powder with the acidic vinegar (or perhaps the buttermilk, which is also acidic, I think - the Wikipedia article really isn’t clear). This seems to be the same reaction; it has something to do with the anthocyanins in the cocoa, which change color depending on pH, and which are also responsible for the color of e.g. blueberries. I am going to leave this entry where it stands, as I said before I’m still pretty confused about how this all fits together.